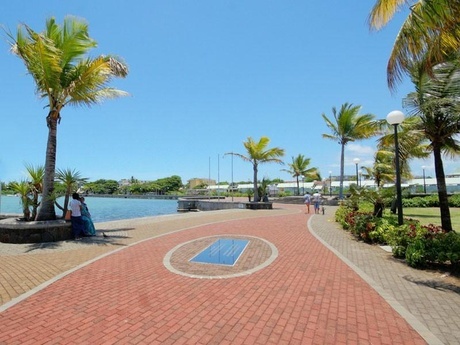 Mahébourg is a small city on the southeastern coast of the island of Mauritius with a population of approximately 15,000 as of 2000. It is the capital of the Grand Port District. It reflects a medieval appearance and is beautifully framed by the dramatic Lion Mountain. Nowadays, Mahébourg has become a bustling centre of local trade. The major occupation of the villagers is fishing. Mahébourg is also home to many hawkers and traders. The town is famous for its market. Mahebourg has a rich history which dates back to 1805 when the town was founded by the last French Governor of the island, General Charles Decaen. At first it was known as Mahebourg, name given in memory of Mahe De Labourdonnais. In October 1806, the name was changed to Port Imperial in honor of Napoleon. Mahébourg Waterfront is a perfect place to walk along the sea and breathe the fresh air, enjoying the marvelous view around. You even have a pavilion to rest and enjoy the view. Visit to Naval Museum is a must as it has the reminiscences of the French colonial empire and the replicas of the ancillary that were used in the historical battle. You can view the cannons, swords and other weaponry from the war in addition to wreckage from ships. Mahebourg Handicraft village is also famous for its collection of traditional handicraft and other handmade items. Every year, the visitors who come here in Mauritius make it a point to visit this Handicraft Museum. You can visit the very old biscuit factory that was established by the Rault family in 1870. It produces square, crispy cookies using a secret recipe without using any modern technology. You can also visit the Notre Dame Des Anges Church, built-in 1849 which has a beautiful architecture that has been modified and restored many times over the years. The bird lovers can visit Airgettes Bird Sanctuary were you can enjoy local wild life. If you are interested in sports or some adventure then you can go for a nature tour or hiking on the Lion Mountain. There are a number of hotels that are found here in Mahebourg. One of the good hotels is the Le Preskil Beach Resort in the midst of the tropical garden with all the facilities you need when you are on a holiday. Other good resorts are Hotel Merville, Le Bamboo Hotel & Restaurant and Shanti Ananda Maurice.